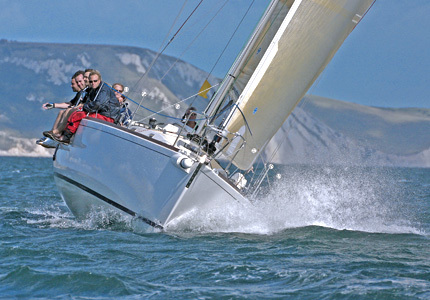 We offer the full range of RYA practical courses to suit your requirements in sailing, motor cruising and powerboats. Our aim is to ensure that all our clients receive the best possible tuition in the capable hands of our in-house RYA instructors both on and off the water. All our instructors are authorised and certified by the RYA. We offer practical tuition on modern yachts, powerboats and motor cruisers or alternatively, we are pleased to be able to offer own boat tuition – again in any of the above categories. Many people may feel more at ease in the familiar environment of their own boat. You will receive a comprehensive brief on the boat being used including specific safety requirements/features and the course content. All boats are equipped to a very high standard both in terms of electronic aids and safety equipment, to make sure you get the best from our courses. Our current school boats are a modern J120 [40’ sail]; Seaward 25’ [motor cruising and powerboating] and Aquastar 45’ [motor cruising]. Please note that no person under the age of 18 will be accepted for any course unless accompanied throughout by a parent or legal guardian. Please note that for own boat tuition, the vessel used must be suitable and appropriately equipped in order that the RYA syllabus can be successfully conducted. This includes safety equipment to the level of an RNLI Sea Safety Check, and equipped with the relevant navigational equipment, documents and charts for the area of intended operation. Advice on achieving these standards can be given. The costs involved are those of running your own boat and the instructor’s fees and any travel expenses, plus any examination or certificate fees charged by the RYA. For residential sail cruising own boat tuition, food should be provided for the instructor. We can also offer tuition for the International Certificate of Competence (ICC) and conduct the ICC Test. If you just want to be a better sailor or find out if you might like it, we can offer advice and short cruises to experience live aboard conditions. We can also offer bespoke refresher and development courses tailored to suit your level of experience, whether on board sail, motor or powerboats. For sail tuition on the J120, you will be provided with waterproofs, although you are welcome to bring your own – you will however need to provide your own footwear and gloves. For Motor Cruising or Powerboat Courses please bring suitable wet weather gear. Lifejackets will be provided for these courses. Full details of all personal equipment and clothing required for the courses will be provided in your joining instructions and can be viewed in our T&C pages.